Check your change at Woolworths this week as the last of the 3 Possum Magic coins are now available. There’s a chance you could receive any of the three coloured coins that are now in circulation. The week 3 coin is mostly orange coloured and depicts Happy Hush as she’s visible again from the popular Mem Fox children’s tale “Possum Magic”. Week 2 and 3 coins appear similar in colour so if that confuses you look closely for the Vegemite sandwich -that’s a week 2 coin. The week 2 Vegemite sandwich Hush is a more purpley coloured coin and the Week 3 Happy Hush more orange. All three new coloured 2 dollar coins have been minted by the Royal Australian Mint and are being distributed through the tills at Woolworths supermarkets. Most stores are adhering to store policy of “pot luck” change distribution so personally I’ve been purchasing a whole hand of bananas one at a time though the self-checkout (yes checkout staff, that’s exactly what I was doing) and I’ve received quite a few that way although it’s very random. Checkout staff may give you up to 2 coins in change when you make a purchase, again adhering to the policy set by Woolworths. Other staff have freely given as many coins as requested by the customer, handed over opened security bags and even unopened bags are now appearing for sale on sites such as eBay -that’s less in the tills for my random banana purchasing. Have a read of our previous articles on Week 1 blue Invisible Hush and Week 2 purple Hush eats a Vegemite sandwich. 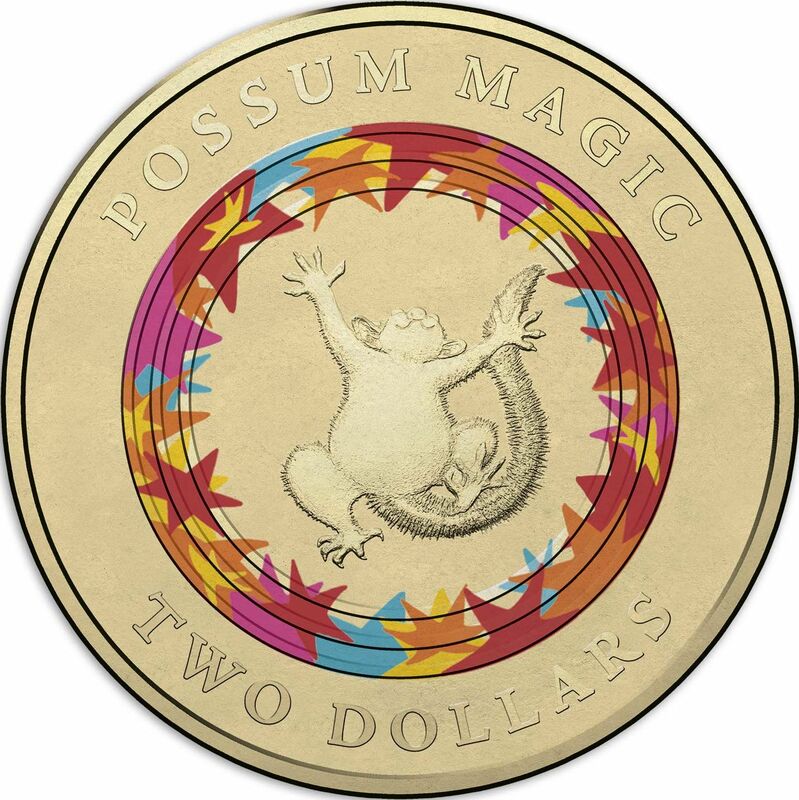 You can also pick up these coins in a complete collection the 2017 Possum Magic coin collection.